UPDATE: If you look inside the disk image, you will see a little app called Quickier.app that records a perfect alpha movie every time. The job of software compatibility testing is never done. There's always another thing to test. 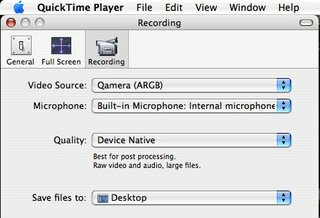 But this morning, we checked another one off our list: using Q@mera-effected movies recorded with QuickTime Pro in Final Cut. Yes! It is true, any Q@mera effected movie that includes an alpha-channel (transparent region) can be dropped right into a Final Cut project (and we'd assume also AE for those pros out there) and composited with other footage. It works great. 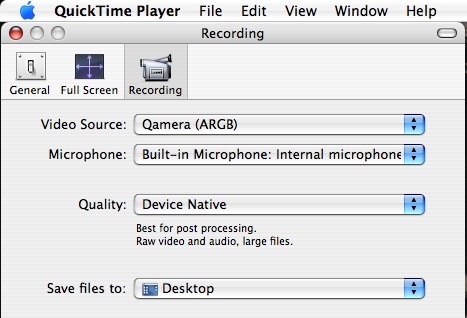 Be sure to set the QuickTime Pro recording preferences to 'device native' or you will not get the transparency channel.